Good morning! Is it cold in your neck of the woods? It's a balmy 15 degrees at my house, but I have a card to share with you today that will give you the warm fuzzies. Here we are, ready for another Peachy Keen Challenge, and this time the challenge is to emboss. You can heat emboss, dry emboss, or both, if you like, just make sure to include some embossing on your card or project. For my card, I cheated a wee bit as I used this beautiful embossed card stock from the Penny Lane collection from My Mind's Eye. This paper is absolutely gorgeous, and I just couldn't pass it up!! Do you LOVE this image, or what? The first time I saw these adorable mice from the Colby and Jack Cheese stamp set (PK-350), I couldn't wait to get my hands on them and get to coloring. As usual, I used my Copics, and I added lots of brush strokes to give little Colby a look like real fur. It's definitely a technique I want to keep practicing, but I like the way this one turned out. I cut Colby out with my Nestabilities, and embossed the edges, then while the die cut was still in the frame, I sponged some Baja Breeze ink around the image with a sponge dauber, leaving the embossed edge white. I just couldn't resist giving this little beauty some blue eyes, and bows to match those big beautiful eyes! Kathy has outdone herself with these images, my friends. If you like to color, then you're going to love the size and versatility of this stamp set. There are are six great sentiments included in this stamp set, along with stocking caps for accessories. Guess what? If you decide to play along with our challenge at Peachy Keen Stamps, you could win a fabulous prize!! One lucky player will receive the Peachy Keen Santa, and Snowman Winter Greeting Card stamp sets, and if we get 100 players, there's an added bonus of a 12 piece set of Copic Ciao markers to a random winner! WOW!!!!!! Grab those embossing tools, and let's see what you've got!! 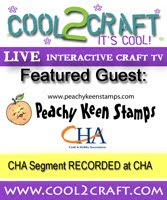 Upload your creations to the Peachy Keen Challenge website for your chance to win, and for complete details, including photos of the stamp sets being offered. While you're there, be sure to check out the wonderful creations from all the Peachy Keen Designers. Their work is amazing, and inspirational, as always!! Thanks so much for stopping by today! I wish you a warm and beautiful day, and lots of happy stamping! Wow, your little mouse almost looks real. I don't think I would ever have the patience. And I LOVE the paper too. It is so pretty. Your mouse is so cute and furry. Love her little bows, the paper, the rhinestones. Everything is put together so well! Love the blue eye shadow too! 15 degrees??? Are you serious??? Here I've been whining about our cold weather, and you are freezing! Sending you some warm wishes, my friend! Love your little mouse. She is just so sweetly colored, and what a fantastic color combo -- wow! Super, super cute. I like the color combo - so cheerful. And your coloring is as always fantastic ! Awwwwww... Lorie, this mouse card is ADORABLE! Love the way you colored the image (duh! Of course, I do... cuz you're FABULOUS!!!) Fantastic card! Adorable card!! Love the way the little mouse is colored. What a cute mouse. Thanks for sharing. Your little mouse is crying out to be stroked Lorie! The colouring is SO clever you can almost FEEL his fur! Your are the Copic QUEEN!!! OMgosh too, too cute! I love the ribbons on the mouse's ears! And I love your CS colors. The way you colored up the mouse image is fantastic.